Ghadames or Ghadamis /ɡəˈdæmᵻs/ (Berber: ʕademis; Arabic: غدامس‎‎ ɣadāmis, Libyan vernacular: ɣdāməs, Latin: Cidamus, Cydamus) is an oasis Berber town in the Nalut District of the Tripolitania region in northwestern Libya. 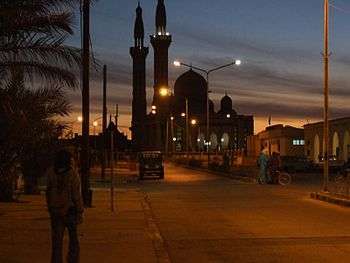 Ghadames has a hot desert climate (Köppen climate classification BWh) with long, extremely hot summers as average high temperature is around 41 °C (105.8 °F) in July, the hottest month of the year as well as short, warm winters. The town is receives little precipitation throughout the year as average annual precipitation is only 33.1 mm (1.30 in). Houses in Ghadames are made of mud, lime, and palm tree trunks with covered alleyways between them to offer good shelter against summer heat. In the 1970s, the government built new houses outside of the old part of the town. However, many inhabitants return to the old part of the town during the summer, as its architecture provides better protection against the heat. The old town, inscribed in 1986 as a UNESCO World Heritage site, was de-populated of its inhabitants throughout the 1990s, leaving the old buildings at risk of collapse due to a lack of maintenance. ↑ "Climatological Information". World Meteorological Organization. Retrieved December 19, 2012. ↑ "Klimatafel von Ghadames / Libyen" (PDF). Baseline climate means (1961-1990) from stations all over the world (in German). Deutscher Wetterdienst. Retrieved 27 March 2016. 1 2 "Ghadames (Ghudamis), Cydamus: the Pearl of The Libyan Sahara". Temehu. 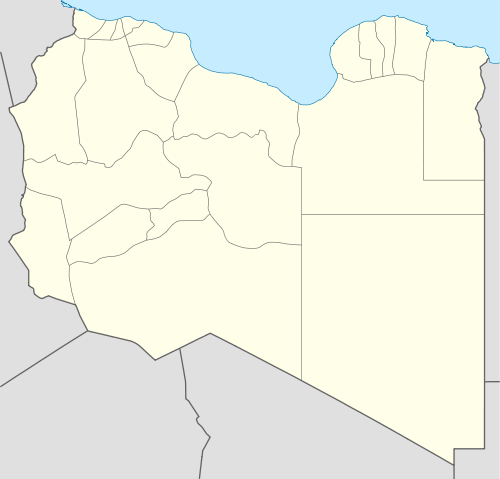 ↑ "Libyan fighters set to seize border town". PressTV. August 30, 2011. ↑ The World Heritage Newsletter, No.9, December 1995. Edmond Bernet (1912). "Ghadames". En Tripolitaine: Voyage a Ghadames (in French). Paris: Fontemoing. Wikimedia Commons has media related to Ghadames. Falling Rain Genomics, Inc.: "Ghadamis, Libya"
Azzouz, Intisar (1980) "Ghadames, Libya" In Safran, Linda (ed) (1980) Places of Public Gathering in Islam: proceedings of seminar five in the series Architectural transformations in the Islamic world, held in Amman, Jordan, May 4–7 Aga Khan Award for Architecture, Philadelphia, OCLC 7208199; photographs of Ghadames.